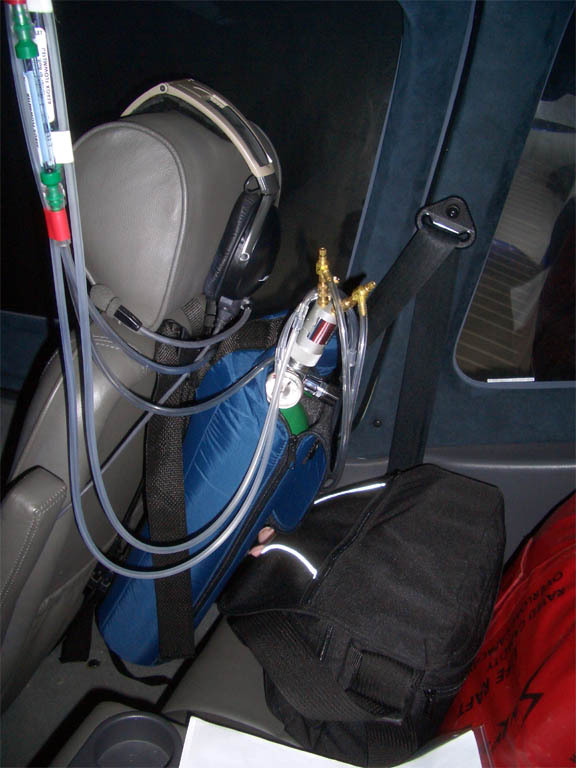 The purpose of this article, originally written in 2004 and since periodically updated, is to summarise the available equipment, for pilots of unpressurised aircraft. Some of the equipment described e.g. from Precise Oxygen is now obsolete and I would not recommend it even if available, because the equipment I now fly with (Mountain High) is so much better. However I have left the notes on the earlier equipment for completeness. 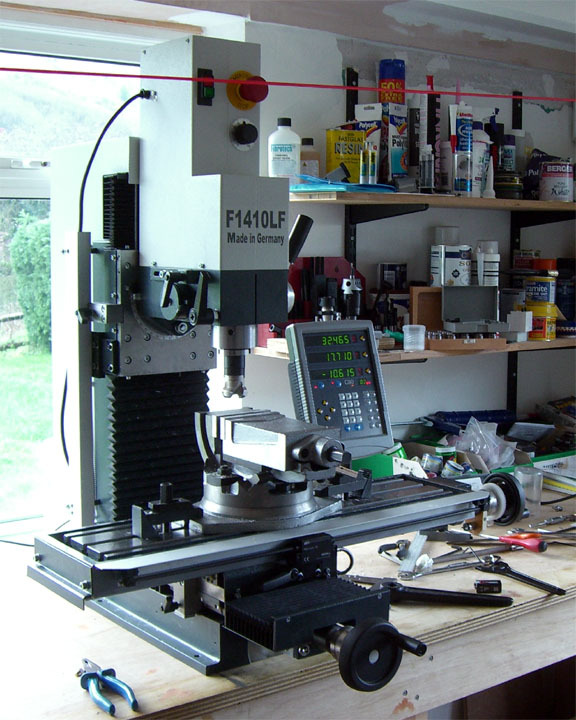 At the very end is a description of the equipment I currently use and which I consider to be the best for the job. I decided to get a portable oxygen kit in 2003 when I was planning a flight into Spain, with parts of the route up to 14000ft. There are a number of portable systems on the market. All are very similar in the main components. The essential features are that all use a cannula (a hollow moulded piece of squashy plastic with a couple of little tubes about 0.5" long which stick up into your nose) to deliver the oxygen. A cannula reduces the amount of oxygen needed (relative to a mask) by about 2x-4x and circumvents the issue with how to make the headset microphone work - it doesn't get in the way. You can talk, eat, etc. The simplest systems have a simple flow indicator for each cannula comprising of a ball which floats up and down a piece of clear plastic tube whose internal diameter is tapered. The main equipment vendors (2004) are Mountain High, Aerox, Nelson (Precise Flow), and a few others e.g. Sky-Ox and Delta. 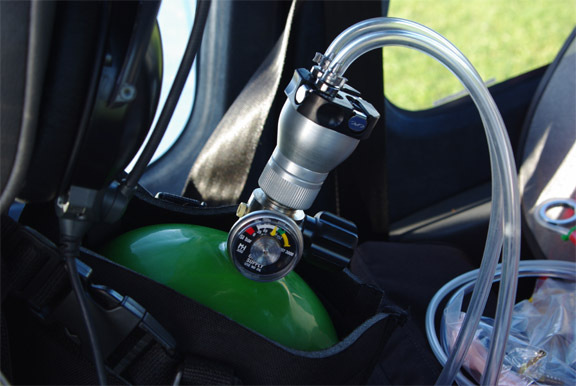 All provide simple systems comprising of a cylinder (which is usually an off the shelf U.S. scuba cylinder, resold at the customary higher price) which carries oxygen at about 150 bar (2250 psi), a 1st stage regulator which drops the pressure to around 25 psi, and cannulas with individually adjustable flow valves. which contains a moustache-like reservoir under one's nose and this is claimed to extend oxygen endurance 2x over a plain cannula; from tests this figure appears accurate. It works by accumulating oxygen in the reservoir which is then drawn into the lungs at the start of the next inhalation cycle; in the absence of such a reservoir the initial oxygen mass would all have to come solely from the tubing which has a limited flow rate. More recently, demand regulators have appeared. These have some means of sensing the inhalation cycle and inject oxygen into the cannula only at that time. The objective is to use less oxygen while achieving the same level of oxygen in the blood. These use plain cannulas, without the under-nose reservoir. Mountain High use a very slick electronic regulator which fits in line with the pipe to the cannula and is claimed to reduce oxygen usage by about 4x. It is pricey but more recently they have introduced cheaper multiple-output versions. The MH regulator fails shut when the batteries run out but you get plenty of audio warnings etc well beforehand. The Precise Flow cannulas used with their demand regulator are plain cannulas like any others but use two fairly large diameter tubes back to the regulator - no doubt to enable their mechanical regulator to more easily sense the pressure drop due to inhalation. This type of cannula is significantly more clumsy than the single-tupe types; the Mountain High cannulas are particularly convenient. 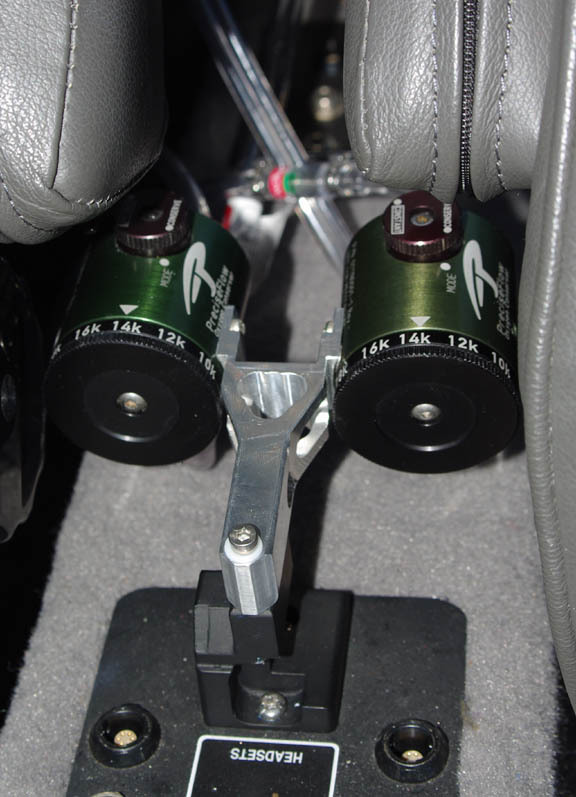 There are more notes on the above regulator at the end of this article, and a flight comparison of the two demand regulator systems is here. Update 8/2012: I was told that the above Precise Flow demand regulator is no longer manufactured, so now the Mountain High O2D2 is the only demand regulator option. Actually (8/2015) it still exists here but if you read the comparison in the URL in the above para, you will not want it! The FAA requires that all pilots flying their aircraft above 12,500 feet for 30 minutes or longer or at 14,000 feet or above during the entire flight must use supplemental oxygen - ref FAR 91.211. Passengers must have oxygen available (but don't need to use it) above 15,000ft. The amount required (reference: FAR 23.1447) is 1 liter of oxygen per minute for every 10,000 feet. For example, at 18,000 feet there should be a flow of 1.8 liters per minute of oxygen available via a standard breathing device. The FAA requires there should be a device so attached to each breathing device that visually shows the flow of oxygen. The FAA also recommends that oxygen be used at night at altitudes over 5,000 feet. A mask (rather than a cannula) is mandatory above 18,000 feet (FAR 23.1447). However, this regulation start with the words "If oxygen dispensing units are installed" [my bold] which most likely means it was written to cover installed systems, whose operating limitations are in the Aircraft Flight Manual and legally must be followed. Portable systems appear to be unregulated, as is the vast majority of "portable" aviation equipment applicable to Part 91 (private flight) operations. I have tested cannulas to 20,000 feet and they worked fine, delivering a ~ 95% oxygen level , but one needs to breathe very deliberately and this would not be recommended for children and other potentially "not responsible" passengers. The UK CAA had no requirement for oxygen on private flights but around 2005 a proposal appeared which was similar to the FAA one but with the "30 minute" height reduced from 12,500 feet to 10,000 feet, and with the mandatory use reduced from 14,000 feet to 13,000 feet. In March 2007 the ANO was changed with this amendment to make oxygen mandatory for more than 30 minutes between FL100-FL130 and at any time above FL130. Passengers were "recommended" to use it above FL130 but it's availability to passengers does not appear to be mandatory. This is the normal European practice of taking an FAA or ICAO rule and gold plating it. The new CAA oxygen requirement is not suprising. What is suprising and is a real problem is that the equipment must be CAA/EASA Type Approved. This is the effect of ANO Article 19 which mandates the type approval, and ANO Schedule 4 which lists the type approval exemptions and fails to mention oxygen equipment. This is a problem because it rules out most or all of the widely used American off the shelf portable oxygen systems ... one wonders what the hell are pilots supposed to use and whether the CAA ever thought this through. Update 1/5/2007: the CAA has backtracked (local copy) and now Type Approval is not required. (a) The pilot-in-command shall ensure that he/she and flight crew members engaged in performing duties essential to the safe operation of an aircraft in flight use supplemental oxygen continuously whenever he/she determines that at the altitude of the intended flight the lack of oxygen might result in impairment of the faculties of crew members, and shall ensure that supplemental oxygen is available to passengers when lack of oxygen might harmfully affect passengers. (2) all occupants use supplemental oxygen for any period that the pressure altitude in the the passenger compartment will be above 13 000 ft. This regulation can be found here which leads to here which leads to here and it is on page 1490! EASA refers to a leaflet which gives tips on how to establish whether people carried are getting adequate oxygen. This regulation applies to all aircraft registered in Europe. It also applies to all aircraft based in Europe but what this means is not defined anywhere. Originally I chose the Aerox equipment because it was most commonly available; it came from AirportShoppe who shipped it to the UK without problems. Well, it took about 20 emails to get some details sorted out; a phone call, or three, might have been quicker. Obviously the cylinder was shipped empty. The cylinder I originally bought was called "D"and held 13 cu ft at the rated pressure of 150 bar. This was the biggest I felt I could carry conveniently in the aircraft. On this trip from the UK to Crete two of us used up 3/4 of it, using oxysaver cannulas. On the first leg only of this trip from UK to Slovenia, mostly at FL160, two of us used up most of one cylinder in about 5 hours, which is somewhat short of the manufacturer's claimed figures, and I was glad I had a spare full cylinder to enable the return flight to be done over the Alps again. A cylinder of this size would clearly not be big enough even for one person doing regular high altitude IFR flying at say FL160 unless refilling is well sorted. Unfortunately none of the portable kit manufacturers appear to have thought about how to mount the flow indicators! These have a simple scale marked in altitude, so if you are at say 12000ft you just turn the little screw on the regulator until the ball in the flow indicator rises to "12"; this has to be done by (or for) each passenger separately. The ball indicator doesn't jam the flow if the indicator is just left lying around, but it doesn't read anything unless it is vertical and the right way up. So I mounted mine as shown, with a round piece of metal at the top ensuring that the pipe doesn't get kinked. It could be done more neatly, with an inverted U-bend made of metal in that location. On the TB20, they are tied to holes in the plastic ceiling grille. The whole setup stays in place all year and doesn't get in the way unless somebody needs to climb between front and back seats. The cylinder mounting position works well too. Even if there are 4 in the plane, the person behind the P2 seat just has to have their legs about 5" apart! One could fit a substantially bigger cylinder than 13 cu ft there, and for flights where oxygen isn't needed but you really need the room, it takes only seconds to take it out of the backpack, leaving the empty backpack to just flop about. Or even unstrap the whole backpack for carrying the cylinder around for a refill. Most 4-seaters are flown with max 3 people max for obvious W&B reasons and then it is a non-issue. This means of securing the cylinder meets the requirement that the pilot (and any passengers) must be able to reach the regulator and the pilot must be able to see the pressure gauge on the cylinder. Another suitable location might be between the back seats, but not too far back otherwise the pilot won't be able to see it or reach it. You will need to carry one full mask too; that's a regulation in the USA, in case somebody has a blocked nose or is not conscious. They are very cheap. The ones you might want to wear full-time are far from cheap, especially if they have a built-in mike, but they aren't needed below 18k feet and anyway their oxygen flow rate is about 4x that of a cannula. The flow indicators are marked with two scales: one for a cannula and one for a mask. One more thing: for obvious hygienic reasons, mark each cannula with the user's name - people don't like getting each other's bogies up their nose I am not sure if Americans call them "bogies" but, basically, bogies are what children eat in preference to brussel sprouts! This is by far the biggest problem with oxygen in Europe. Most airfields have no facilities for refilling, and those that do tend to cater for bizjets and airliners which have fixed cylinders and the refilling is done via a hose. Even if one can get a refill, the time and the hassle is likely to dwarf the time it takes to get fuel. I once paid £75 for a refill - in the UK. So, most pilots flying around the UK or into Europe will prefer to fill up back home. Pilots may therefore prefer to buy the biggest cylinder they are willing to carry; the extra cost is minimal. 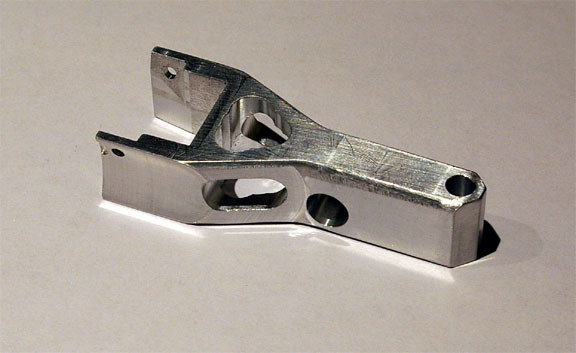 The last item in the above list, the "540 adapter", was recommended by Aerox. I didn't need it for a long time as I used a local paramedic cylinder refiller who had fittings for everything imaginable. They ceased trading and then I started going to scuba shops (some scuba shops do supply oxygen) and used it there. The adapter screws to the top of the Aerox cylinder and screws directly into a standard British Oxygen oxygen storage cylinder which has a "5/8 BSP female bullnose" fitting on it. The "540 adaptor" alone is not a good solution, because it rigidly couples your cylinder to the source cylinder, in a clumsy right-angle configuration, and your cylinder needs to be supported during the refill process. A better solution if using scuba shops is to get a cylinder with a DIN thread and the scuba shop should have a hose which can connect to it while it is standing on the floor. However, this also means the 1st stage regulator (which screws onto the valve) needs to have the same thread. Avoid mentioning the word "aviation" as most scuba shops will refuse to serve you. More recently, I have had problems with scuba shops' attitude to filling non-scuba cylinders, plus frequent out of stock situations, so I rented a big storage cylinder from BOC; this is a vastly cheaper and more convenient arrangement; it costs about £100/year rent and about £25 for a swap with a full cylinder. 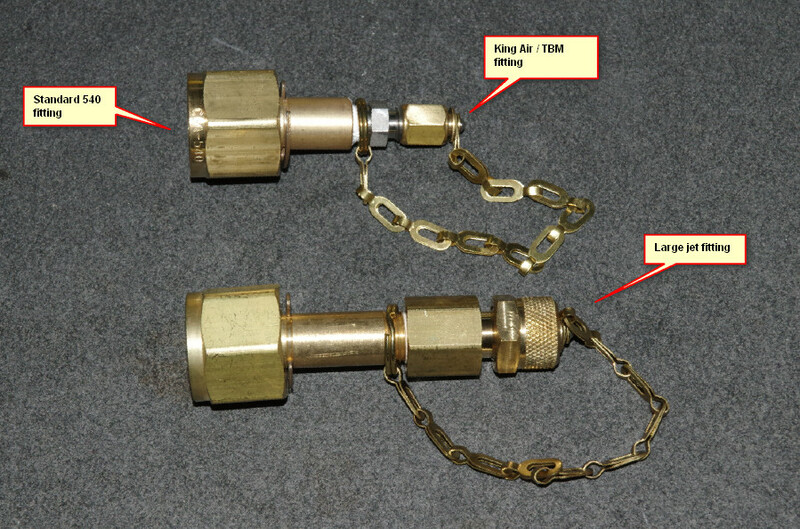 The Aerox cylinder can be refilled from the storage cylinder either directly via the "540 adapter" or via a suitable hose, as described below. Obviously, if you have your own refill facility then the cylinder thread becomes irrelevant and the US 540 thread is as good as any other. There are also oxygen outlets which will sell you a cylinder without the annual rental but with a cheap swap deal - example. I just haven't found one that will do it with cylinders large enough to be useful. This is important with any high pressure gas but oxygen adds an additional risk in that certain substances will spontaneously ignite when subjected to oxygen at the high storage pressures. Hoses must be made of the correct oxygen compatible-material and no grease may be used on or inside the fittings. In fact there is an oxygen-safe grease available but you will not need to use lubricants in anything described here, anyway. The story about oxygen igniting lipstick is rubbish since the oxygen pressure inside a mask, or near a cannula, is much too low. The cylinder must be securely stored so it cannot fall over, which could damage the valve. If standing up, it must be secured to the wall with a strap or chain. The aircraft cylinder and the refilling hose should be regularly pressure tested. 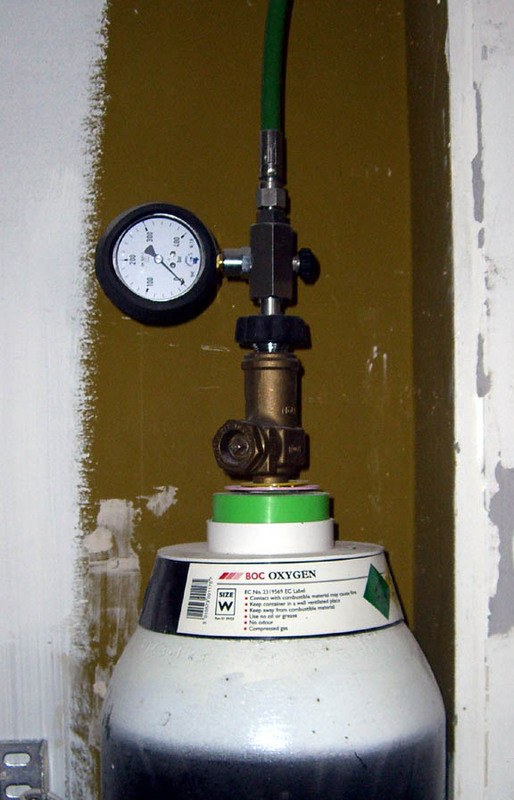 Specific safety precautions must be exercised when DIY refilling from the large cylinder shown above. 1. Ensure all fittings are clean and free of grease and other contaminants and threads are undamaged. 2. Purge the hose of air, by opening up the valve on the source cylinder a little bit until oxygen is coming through and out of the open end. 3. With both cylinder valves shut, connect the interconnecting pipe and ensure the fittings are tight. Obviously, ensure that the fittings were properly screwed on; a fitting might appear tight because you cross-threaded it but will fly off at great speed when it gets 3000psi gas inside it! At 3000psi, a fitting with 1 inch of internal cross-sectional area will have 1.5 tons of force trying to pull it apart. 4. Check the pressure relief valve on the refilling hose is shut. 5. Slowly open the valve to your aviation cylinder. 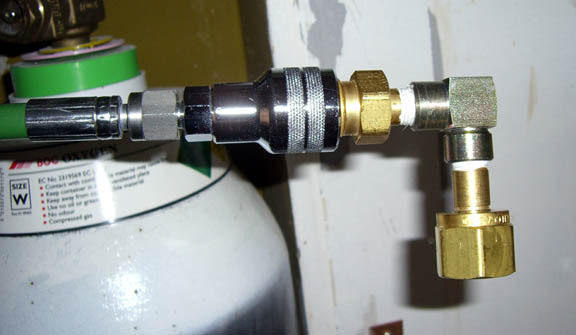 The remaining gas in the cylinder will now fill up the refilling hose and will show up on its pressure gauge. 6. Very slowly open the source cylinder. This needs to be opened only a very small amount. The aim is to spend at least a few minutes filling up your cylinder; doing it faster warms up the destination cylinder excessively. Commercial refillers often place the cylinder being filled in a container of water, to cool it. 7. During the refilling, watch the pressure gauge on the destination cylinder. It's a good idea to be at least a few feet away, just in case. When this reaches the green mark (150 bar on most aviation cylinders), close off both cylinder valves, slowly open the pressure relief valve on the refilling hose, and unscrew the refilling hose. Disclaimer: These instructions are intended for people who know what they are doing when it comes to mechanical things, who know about pipe fittings and know how to tighten them correctly, etc. If you are at all unsure, use a commercial refiller or your local scuba shop! Different cylinder vendors specify them in different ways and it's hard to compare directly because some are rated to 150 bar working pressure while others are rated at 200 bar, and obviously the latter will hold more gas. A description like "13 cubic feet" is meaningful only at a specific pressure. However, filling a cylinder to 200 bar is pretty difficult since oxygen is normally sold in 200 bar cylinders to start with! Hence, the customary de-rating of oxygen cylinders (which normally start their life as 200 bar scuba diving cylinders) to 150 bar is not a problem. All have the same purity specification of 99.6%. The typical actual figure is 99.8%. The only thing that differs is the paperwork and the price. Even the old story that aviation oxygen is more dry (which would make sense) is untrue; the manufacturing process is the same but the QA does differ in that with aviation oxygen there is a limit on the permitted water content. So aviation oxygen might be more dry than welding oxygen but normally it is the same stuff. I also put to him whether there is any truth in another story: the oxygen reacts with the steel storage cylinders and after some months may become unsafe to breathe. The BOC man said there is no truth in this; they inspect their cylinders for corrossion only every 10 years and rarely find any. Welding oxygen needs to be very pure: a 1% reduction in purity increases oxygen consumption 25% and reduces the process speed by 25%. It's one thing to see oxygen flowing to the cannula (all systems provide some flow indication) but the real measure is whether it is doing the person any good. One needs to measure the oxygen level in the blood. The oxymeter can be used to check your (and passengers') oxygen levels every 10 minutes or so. Just poke a finger into it; that switches it on and within seconds it reads your pulse and the oxygen level. The general rule is that you should not allow your flying oxygen saturation to fall more than 10 percentage points below your ground level. So if on the ground you measure 98%, take 88% as your lowest limit. In reality, with oxygen available one doesn't need to get anywhere near as low; like a lot of people I am about 98-99% on the ground and have no problems achieving 95% or better with oxygen in flight. One standard recommendation for the brain working optimally is for the pilot's airborne oxygen level to be no more than 5 percentage points below the surface level, and most pilots will need supplemental oxygen to achieve this at anywhere above 10,000ft. Normally I use oxygen at/above 10000ft. However when I have used it lower down, say 5000ft, I find I get far less tired after a trip of several hours' duration. It's worth doing especially as the oxygen usage at 5000ft is very low. The flow rate required to achieve say 95% oxygen saturation varies considerably for different people and circumstances and precise guidelines are not possible to write. Smokers have more problems than non-smokers. I have flown with people who appear completely unaffected at 14k feet (and have oxygen saturation around 92%) and also with people whose vision was too poor at 12k ft to read the instruments, with an oxygen level below 80%. Unsuprisingly it makes quite a difference if one breathes deliberately through one's nose (as one obviously should), or not. Breathing through one's mouth here and there is just fine but doing it for minutes or longer makes the whole thing a waste of time. If one sets the flow to the correct level for the altitude and breathes very deliberately for a minute (which in reality one never does) one should achieve something close to one's ground level. In constant flow systems, virtually everybody uses the same cannulas: the Oxysaver/Oxymiser cannulas. There is no possible difference in endurance between one system and another. My impression is that Mountain High equipment is of the best quality, but any of the others will do fine. 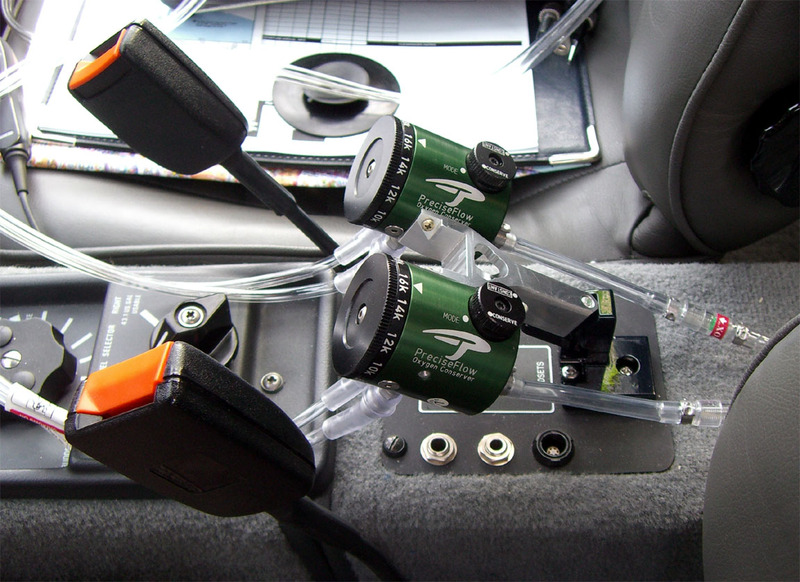 None of them have flow indicators which are convenient to mount in the aircraft. With demand regulators there is considerable scope for endurance variations, because the regulator has to rapidly sense the start of the inhalation cycle and inject the oxygen very early, to get the best out of it, and then shut off the flow to prevent waste. But it is hard to compare these systems. One would need to do a controlled flight, with blood oxygen monitoring and with the cylinders being fitted with precise pressure gauges so actual oxygen usage could be measured. Update 11/2007: a detailed performance comparison is here. 2013 - The following Precise Flow equipment is now obsolete. 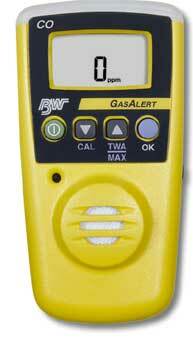 I chose the Precise Flow demand regulator over the Mountain High one largely to avoid batteries. It works very well. I have found that if I get say 95% saturation with a constant flow oxysaver cannula, with the Precise Flow demand regulator I need to set it 2000ft higher to get the same saturation. It is still saving gas relative to the constant flow system but the saving is most likely not what is claimed. The output pressure from the Aerox 1st stage regulator (which is screwed into the top of the cylinder) was measured at 27 PSI and this was confirmed by PF as fine. The PF connector didn't fit the Aerox outlet but this was easy to fix by re-joining the clear pipe. On balance, I think this system is better than the Aerox flowmeters hanging down from the ceiling! However, it would be good if this regulator could be mounted somewhere, to reduce the amount of pipework which is still present. 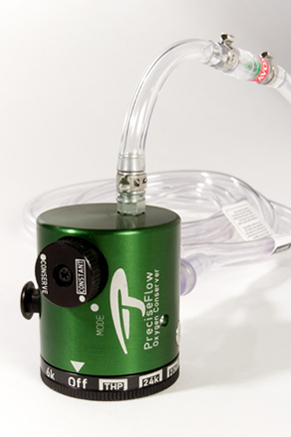 The regulator includes a small spring-loaded flow indicator which moved along when you inhale, indicating that the oxygen is flowing correctly, but there is no indication of the actual oxygen flow rate. 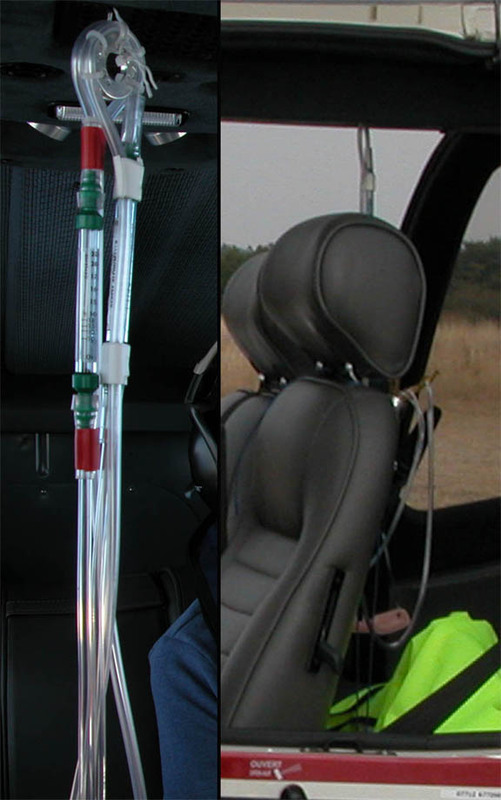 The PF regulator has the same problem as the Aerox system with its floating-ball flowmeters (that need to be held vertically to get an indication): the pipes come out in every direction and the cockpit ends up like an operating theatre. If all the pipes entered the regulator at one end, and the other end had some kind of a mounting attachment, that would be much better, but it doesn't and apart from the seat belt clip provided there is no way of attaching the regulators to anything. especially when the oxygen pipes have been tidied-up by routing them all towards the rear of the aircraft. When the regulator assembly is in place, it does obstruct the old-style headset jack sockets but I don't use those anymore; I use the single aircraft-powered versions. I think the manufacturer should sell something like this, which would enable the regulators to be easily mounted in pairs. I have discovered a significant issue with this mechanical demand regulator: it uses the exhalation to shut off the flow of oxygen. It's clear it uses the inhalation to open up the flow, but if your exhalation is a bit lazy then the oxygen flow gets shut off very late (which is just inefficient in terms of saving oxygen), and if you just happen to remove the cannula before exhaling then the oxygen just keeps coming out indefinitely... I can see why they did it this way (it avoids having to spring-load the pressure sensing diaphragm) but if one of the users of the system removes their cannula there is about a 50% chance of ending up with a constantly open flow and one could easily waste a whole cylinder of oxygen. This is a good reason for going for the more intelligent Mountain High electronic demand regulator - despite its requirement for batteries and its suspect failure mode which shuts off the oxygen totally. I have written to Precise Flow for their comment on this but they have not replied. 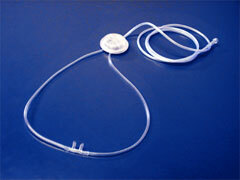 The cannula (all types) is fed with two thin tubes which you are supposed to place behind your ears. These can create a gap under the headset earcups which lets some noise in and this can be particularly noticeable with good ANR headsets like the Bose-X. This is why posey sunglasses like Oakleys (very thick and rigid side pieces) are no good for flying. So, when en-route and all set up, I like to pull the two tubes out from behind the ears and let them rest them somewhere higher up, outside the headset earcups. Always close off the main valve on the cylinder when oxygen is no longer required - do not wait until the landing. It's easy to forget and the whole cylinder will be gone by the next day. With demand regulators this accident is less likely because they shut off the gas virtually completely, but the Precise Flow regulator will do this only 50% of the time - see details above. Passenger briefing: Tell everyone to breathe properly and breathe through their nose., and check their oxygen levels regularly. Children: There are "child cannulas" available which are just smaller cannulas. I have not seen child-sized oxysaver cannulas. You need to remember - if using constant flow - that a plain cannula needs about 2x more oxygen than an oxysaver cannula for the same effect. Also, children tend to breathe through their mouths, particularly when sleeping, and this is obviously no good. A mask is one solution but even the $400 ones (with a built-in mike) are relatively uncomfortable and the oxygen flow rate is high. I would be careful when flying at significant levels (say, 16k feet or higher) with a child and ensure that the child has been told how to breathe, remains awake while at the altitude, and its blood oxygen is checked regularly. It isn't as cheap as the paper cards which are supposed to change colour, but unlike most of them it really works. It even picks up CO left on the runway by the aircraft that just landed before you. One never switches it off and the battery (a commonly available lithium type for cameras) lasts a whole year. Another more recent product is the Check Mate Pulse Oximeter which at US$189 is a lot cheaper than the Nonin. from Mountain High (they sell direct from the USA) and the cylinder is described here with the PDF data sheet here (local copy). The CFFC-48 cylinder is much cheaper than other cylinders of similar size, for some strange reason. This larger cylinder has solved all refilling problems. It also has a more subtle advantage: it holds enough gas for a long trip even if not filled to its maximum working pressure. In the real world, you are filling from another cylinder, not with a boost pump, so you cannot ever get more pressure than the source cylinder, and this pressure obviously diminishes as you do more refills. With the smaller cylinders, one needs to get all the gas into them that one can get, but with the bigger one this is much less important and this makes the BOC cylinder usable for a lot longer. It has been claimed that the widely used US-made 540-threaded aviation oxygen cylinders (such as those described in this article) cannot be legally pressure (hydrostatically) tested in the EU. This is untrue and for example MEL can test them for around £130 - both aluminium and composite types. It is important for the cylinder to have a DOT- number marked on it. However, hydrostatic testing may be uneconomical because one can purchase a small aluminium cylinder complete with the 540 valve and pressure gauge, for around US$ 200... (plus shipping and import duty). There are fortunately other cylinder test options, to be found in the scuba cylinder business, which come out around £30. After 2-3 years of use, both of the Precise Oxygen regulators failed. One developed a minor fault: its OFF position did not shut off the gas flow. The other was one day found to be jammed in the open (constant gas flow) position which is "fail-safe" but obviously uses a lot of gas. Precise Oxygen kindly repaired them free of charge and reported that there was some kind of liquid contamination. They also commented that I had them mounted in an incorrect orientation, which should be with the inlet pipe uppermost (or within 90 degrees of that orientation). 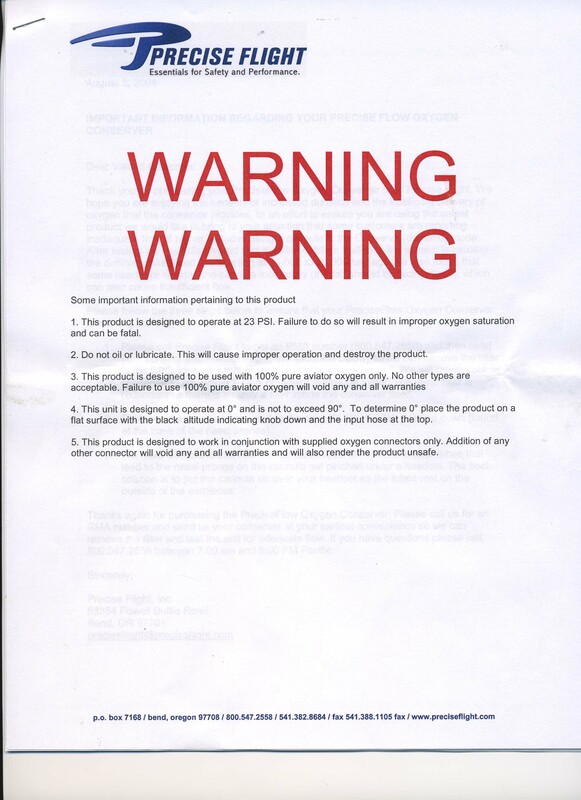 When the repaired units arrived, the documents included an un-dated sheet stating this, but the latest edition of the regulator operating instructions (found in the bag with the returned regulators) did not mention this requirement, and neither did any previous instructions. This is a puzzle since the recommended mounting method (belt clips) is not going to deliver any assured orientation and due to the inlet pipe pulling downwards will generally result in the opposite orientation to that referred to in the above sheet... I tested the two regulators and as expected found them both working well but found a most curious change in their operation from the way they always worked previously: they shut off by themselves, within about 2 seconds of the end of inhalation and with no need for an exhalation! It is however possible that this behaviour is dependent on where exactly the 1st stage regulator output pressure lies; Precise Oxygen state 23 PSI in the aforementioned un-dated sheet but the actual instruction sheet states 22-35 PSI. A not insignificant amount of email correspondence has failed to clarify these matters. I kept the old (Aerox) 1st stage regulator, attached to one of the old aluminium cylinders, as a backup system to carry on all long trips. The failure of the 1st stage regulator almost halves one's operating ceiling and is a major item affecting flight planning. and it moves the regulators away from the headset sockets. 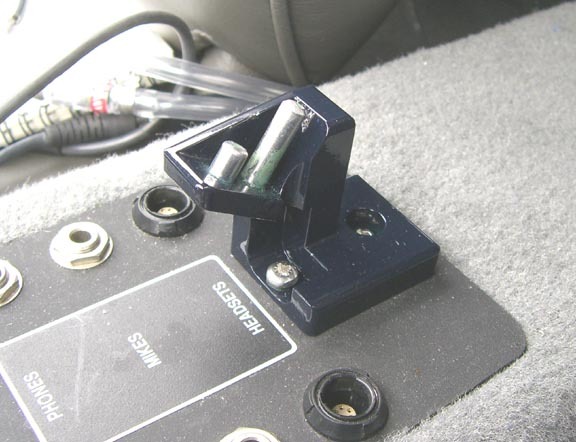 The same mounting method could be used to mount a couple of the MH O2D2 electronic demand regulators. My current view is that the best system is one of the 48 cu. ft MH composite cylinders referred to earlier (which are exceptional value for money) and two of the MH O2D2 regulators. 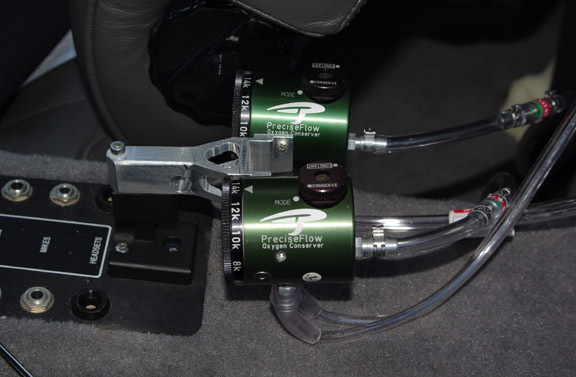 Having two regulators covers four persons and provides a backup regulator on 2-up flights. Carrying a couple of oxysaver cannulas, plus the obligatory mask, completes the system. 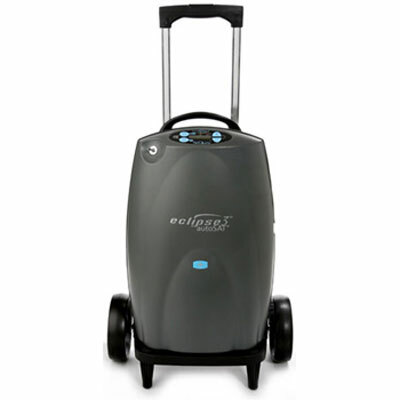 Some interesting, though pricey, options have appeared on the oxygen scene in 2012/2013, in the form of oxygen concentrators. Oxyfly (local copy) and Inogen (local copy) are selling these portable generators. They use a nitrogen absorption process whereby the nitrogen is absorced in multiple cylinders containing zeolite crystals (which are then vented in a rotating manner to the outside air) and percentage of oxygen is thus increased from the normal 21% figure to about 90% which is good enough for this job. 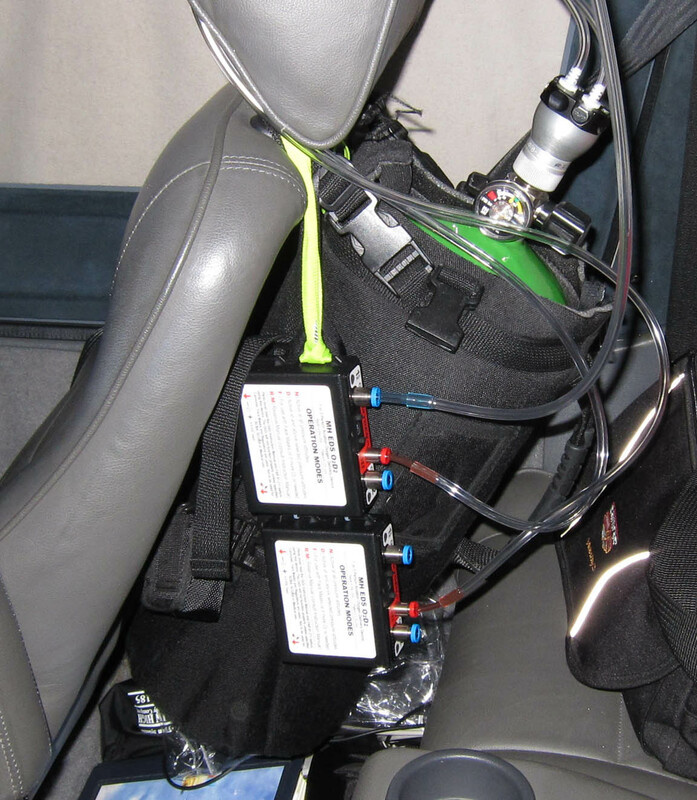 In fact there are many of these zeolite-based oxygen concentrators on the market, down to $200, but these are designed for surface use by people with medical problems and the highest altitude they may work to is the 8000ft airliner cabin altitude. The Eclipse is perhaps the most robust one, specified to 13000ft but tested to 20000ft, and often sold to the military for medical emergency use in unpressurised transport / rescue aircraft. I have seen these on Ebay for about £1000 - example. I am familiar with some tests of the Eclipse generator. It outputs very little pressure (over the ambient) so is no good for demand regulators which rely on delivering high pressure (~20psi) pulses at just the right moment in each inhalation cycle. They are really intended for use by one person per generator, wearing a normal plain cannula, or perhaps the oxymiser cannula, and for this application it is a good solution. An emergency oxygen cylinder with a 1st stage regulator and a cannula or a mask is still needed in case the generator fails. They do draw quite a lot of current and a dedicated power outlet needs to be installed, with a circuit breaker etc in the usual way. 1. Redundancy (obviously), for both unit failure and batteries going flat. 2. Ability to have a cannula for one person and a mask for another. Cannulas and masks require a different O2D2 regulator mode, though in reality one can just use the "mask" setting anyway (and end up using more gas). There is no apparent practical way to "properly" mount the O2D2 regulators, while retaining access to the battery compartments. On this trip, which was done 100% on oxygen, we (2) used up about 50% of the gas cylinder. I am still using the above kit which is excellent. I have two of the 48 cu. ft. composite cylinders. I bought a couple of refill adaptors which enable the cylinder to be refilled from jet service centres. This is usually expensive (upwards of 200 euros) but European IFR can be almost impossible without oxygen... One of them takes the TBM type fitting and the other one takes the large jet type fitting. They both came from Mountain High. They are described here and were relatively cheap.